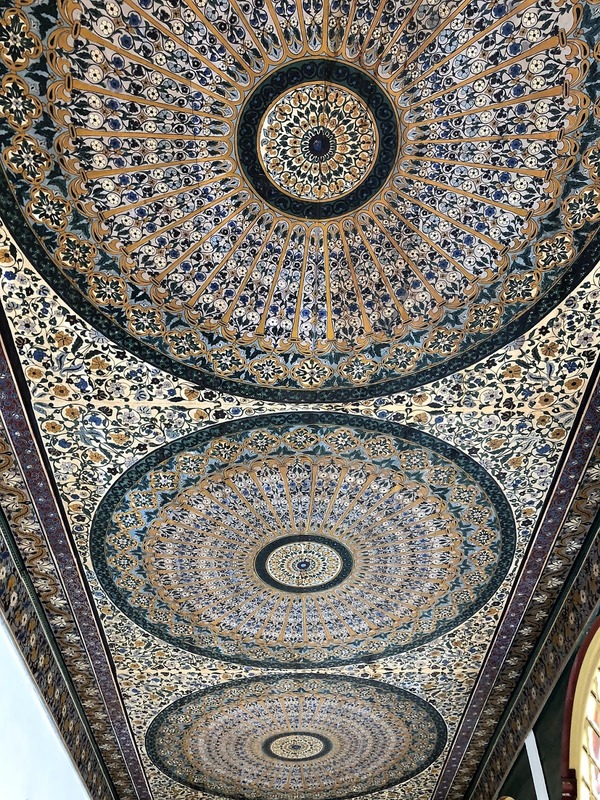 I have always been fascinated by Islamic art and for the last few years I have been incorporating some of its fascinating elements in my art. In Morocco a rich Islamic architectural heritage exists resulting from various dynasties throughout its history. The culture is as diverse due to a blend of Arabic and Berber people. 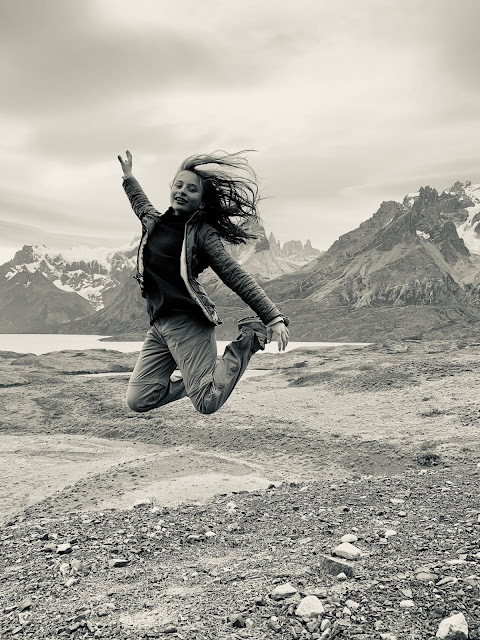 It is an amazing place for new inspirations and self-evaluations while observing the extraordinary lives of these people and the remnants of their past. “Except the skies nothing is the same”, said my daughter after we passed through a few cities. True, it is absolutely different from any other place. 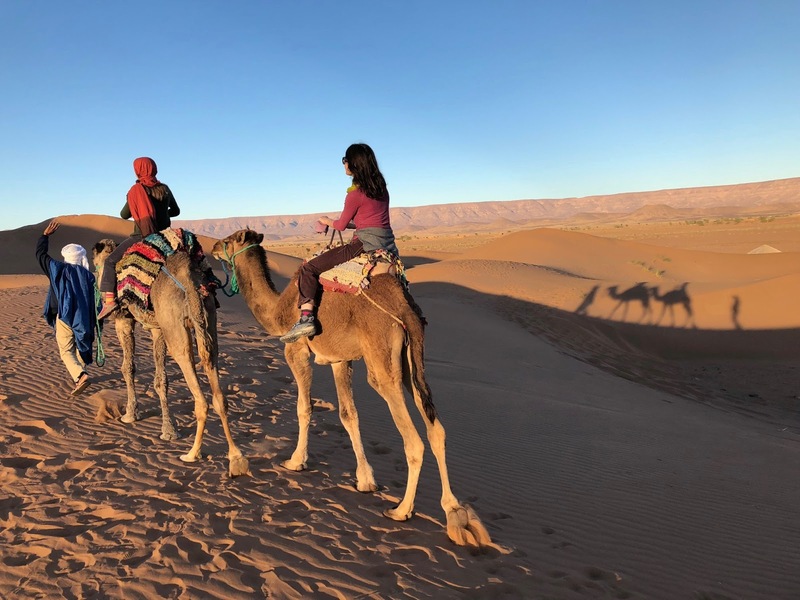 We limited our trip to the northern half of Morocco and traveled through the High and Middle Atlas regions and entered into the Ouarzazate region where the Sahara desert begins. 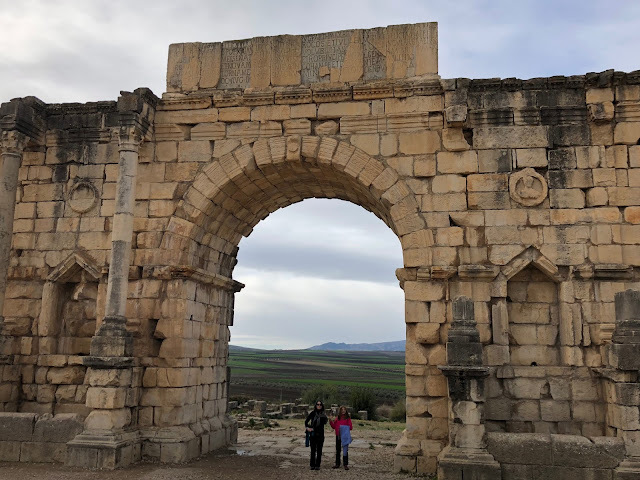 We passed through Casablanca and stayed two nights in Meknès, a small town located on the fertile lands between Rarb and Middle Atlas. 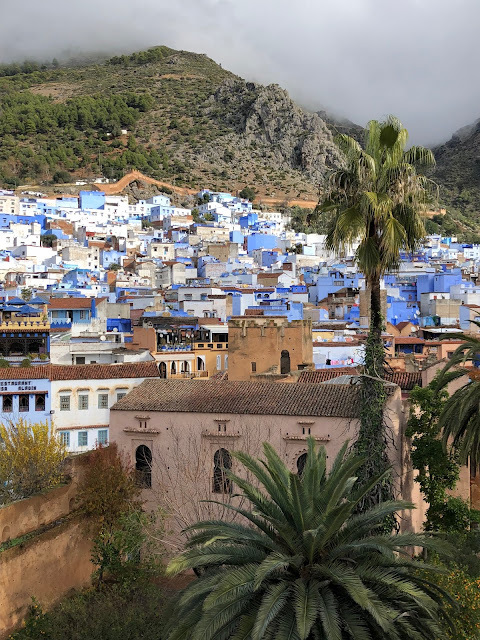 We then drove to north towards the Mediterranean to stay one night in the blue-white town of Chefchaouen. 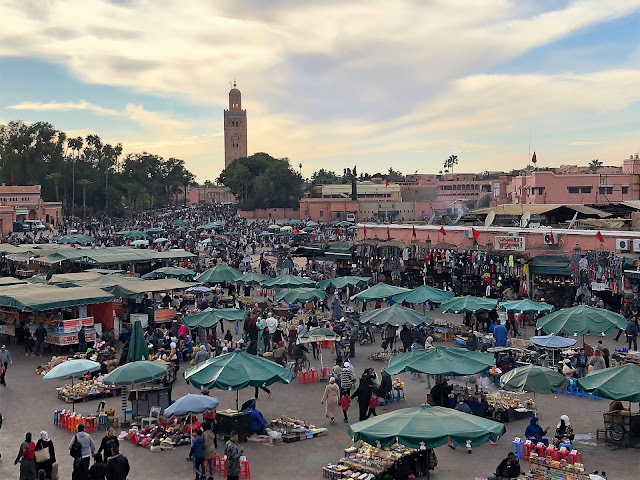 After one day in Fès we took the night train to Marrakech. We explored the area around Marakkech during our 3 days there. 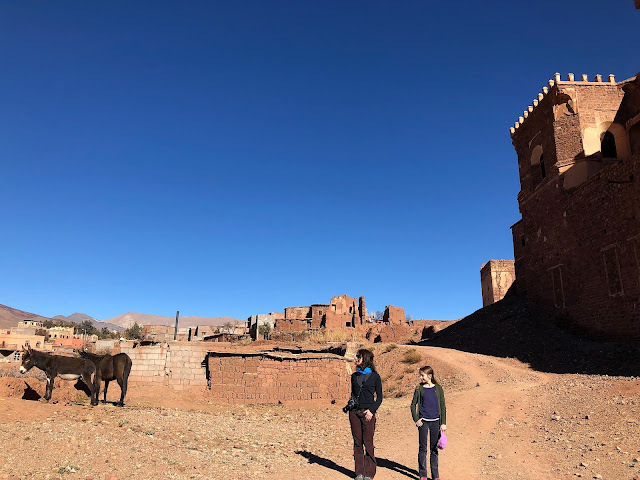 Aït Benhaddou was our last stop where we stayed for two nights. We traveled the Draa valley down to the Sahara desert. 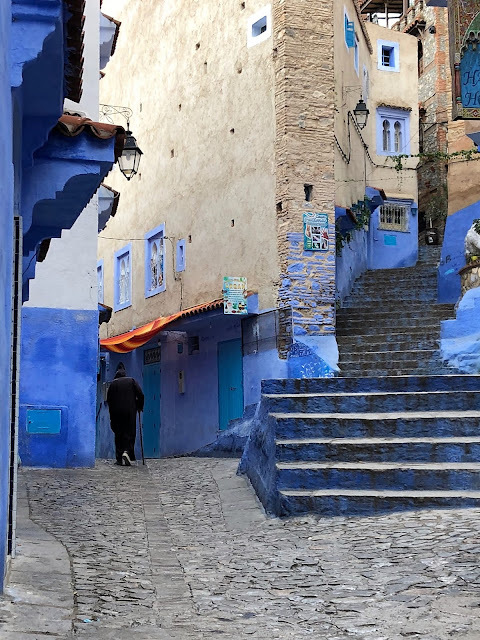 Meknès was a reminiscence of the past while Chefchaouen is a relaxing hippie town of the present. Fès is a labyrinth with tall walls and Marrakech is lively but feels too much of everything; noise, pollution, people. 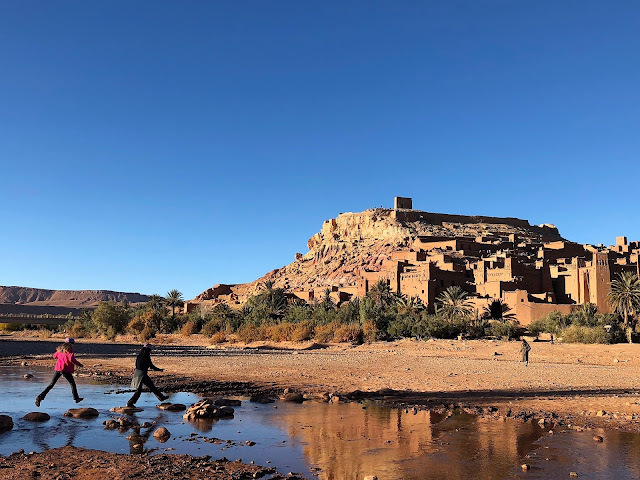 Aït Benhaddou and the Sahara is like a dream made of red earth. 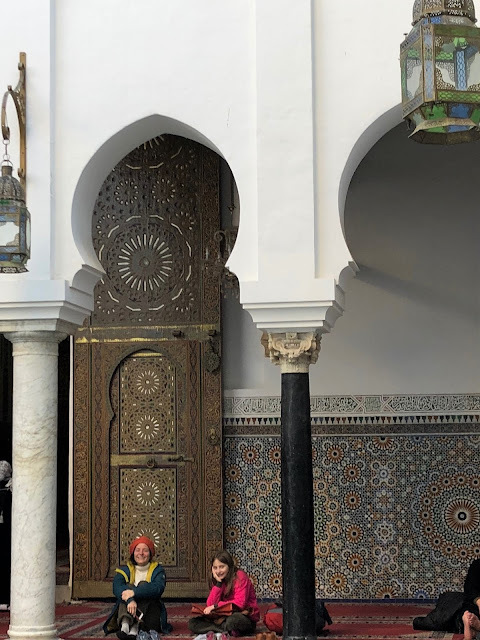 From the airport we drove through the congested streets of Casablanca to see the magestic Hasan II Mosque built in 1993. It is the second largest religious building in the world after the mosque in Mecca and is built on the waters of the Atlantic Ocean. My daughter and I were given permission to enter the Women’s Gallery on the terms of declaring the Shahadah (Declaration of Faith. The huge gallery ornamented with chandeliers and mashrabiyyas was empty except the long rays of the setting sun and a few praying women. Before driving to Meknès we stopped for some street food sold in front of dilapidated buildings painted with figures of old ladies and ships. Without the help of a store owner it would have been hard to find the hotel hidden on a curving road within the medina, old town. A large unheated courtyard dim with hanging lanterns was an unexpected sight after the chaos of the night outside. 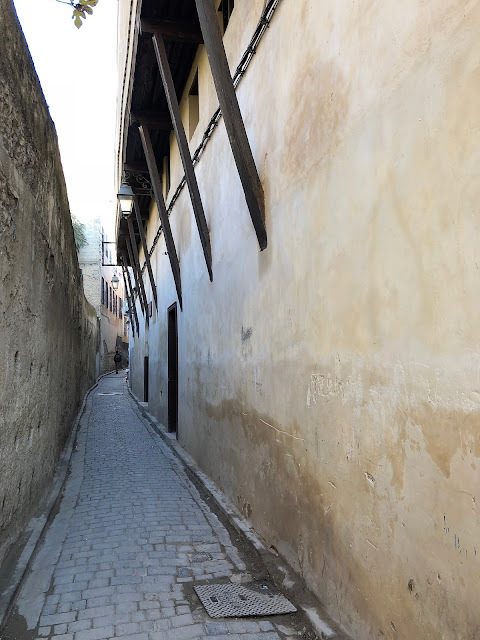 Next morning, after having breakfast with mint tea, bighrir (bread like a crumpet) and apricot jam, we strolled through the medina for a few hours. 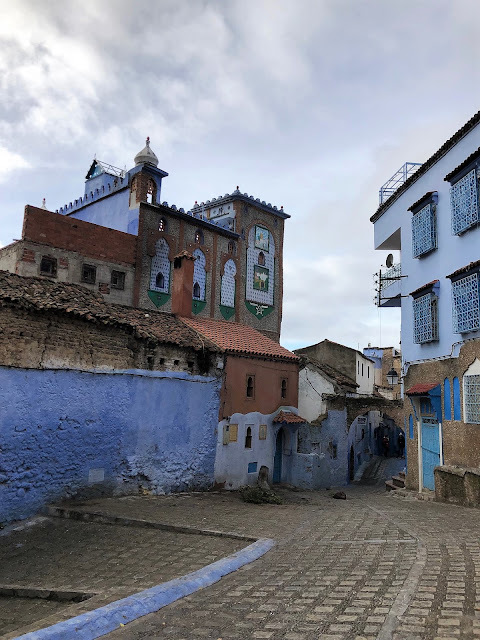 When rain started to keep a fast pace, we sat next to a group of old men in traditional striped jellabas with pointed hoods and savored strong Moroccan coffee. 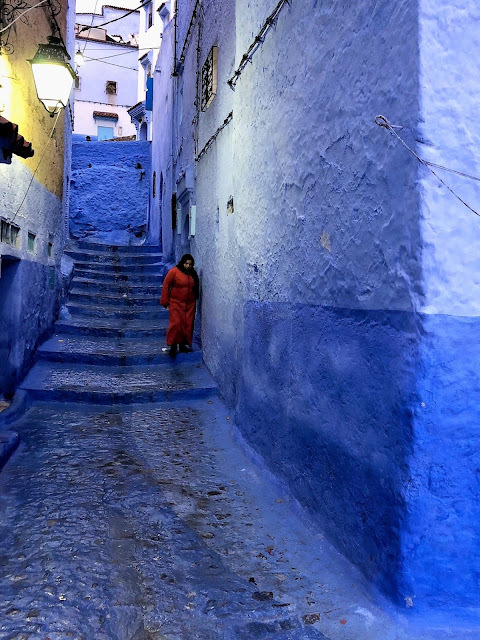 A medieval labyrinth of narrow streets, the medina is a place to be lost without shame. One can see the sky only in squares with mulberry trees as old as the town itself. Tailors, cobblers, damask makers and embroiders work in their one person shops with a concentrated slow paste without lifting their heads. The tailors sew jellabas with 5-6 strings at a time fed by spinners set outside the store. A few old men sell dry bakeries from their small display windows. Wood workers continue to work until late hours on their work benches in front of their stores. An elderly damask maker invited us to his store and told us about his craft that passed through a few generations to himself. All this had a sensation of the past, not today nor tomorrow. Bau Inania Medersa is on one of roads with streetlights on throughout the day. 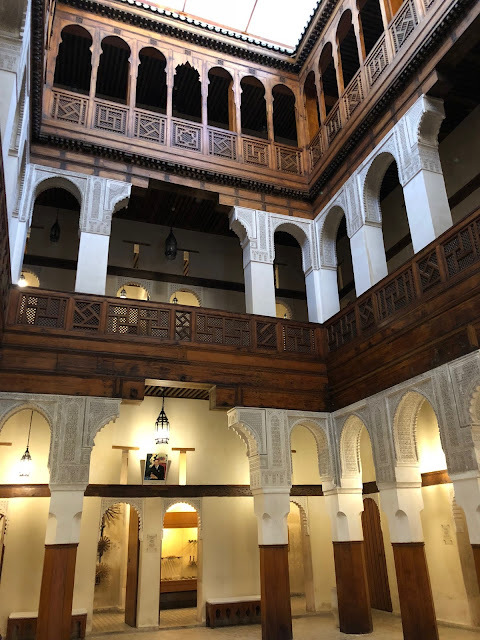 Tiny rooms of the students open up to a courtyard with intricate wood carvings and stuccowork not affected from the rains of the last 700 years. The zellij tiles in tones of green, yellow and blue embellish the walls beneath. The tight structure of the buildings that are seen from the medresa’s roof explain the darkness of the city below. Moulay Ismaïl is the founder of Meknès. During his reign of 55 years, he built fascinating structures employing death sentence on the slowest workers. He robbed the ruins of nearby Roman town Volubilis and the Palais el-Badi in Marrakech to embellish his imperial city, “kasbah”. A rather ugly man, his request for marriage with Louis IV’s cousin was not granted. Bab Mansour el-Aleuj, the finest gate in Morrocco was begun by him and completed by his son. It overlooks the large square Place el-Hedime named after the ruins of a Merinid kasbah that Moulay Ismail razed to make space for his palaces. Now the square is crowded with earthenware and food sellers together with motionless donkeys. It was getting dark when we arrived at Moulay Idris, about 20 km northeast of Meknès. 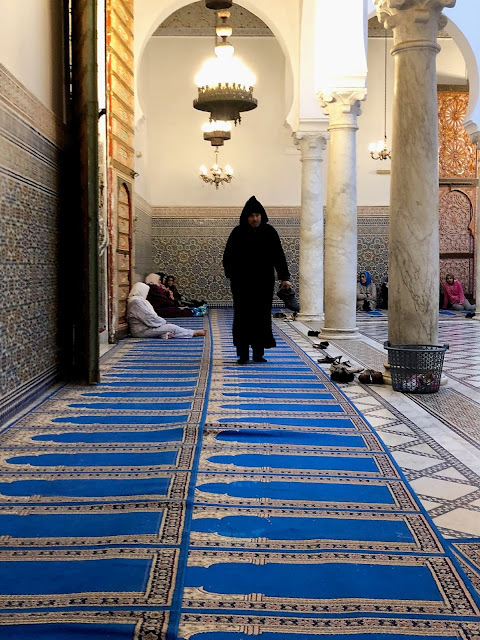 This is where the first Arab dynasty in Morocco was founded by the great grandson of the Prophet Muhammed. It is one of the most important pilgrimage sites in Morocco. In the courtyards of the mausoleum of Idriss, otherwise idle men insist on guiding you through the obvious corridors. 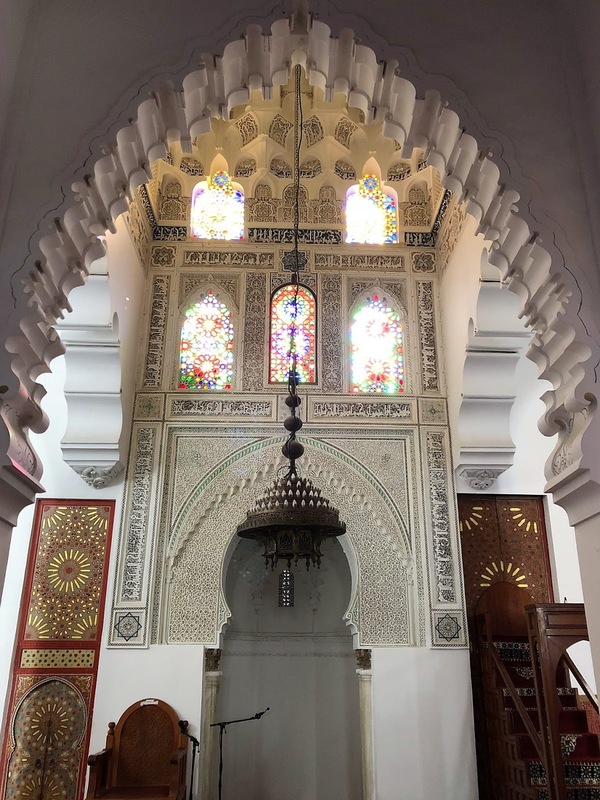 The stuccos in the mihrab and the colored glass windows in the praying room were exquisite. The next morning we visited Dar el-Ma and Heri es-Souani built by Moulay Ismail. Dar el-Ma, the Water House used to hold the town’s water reserves which were drawn by horses through the use of water wheels. Now its hangar like rooms allow only the darkest tones of yellow through its high arched doors. Just behind the Water House is Heri es-Souani, the Grainstore Stables is open to the skies since the earthquake that destroyed its ceilings in 1775. Its thick walls that used to help to keep the temperatures low is now surrounded by an overgrown vegetation where kittens stroll around. 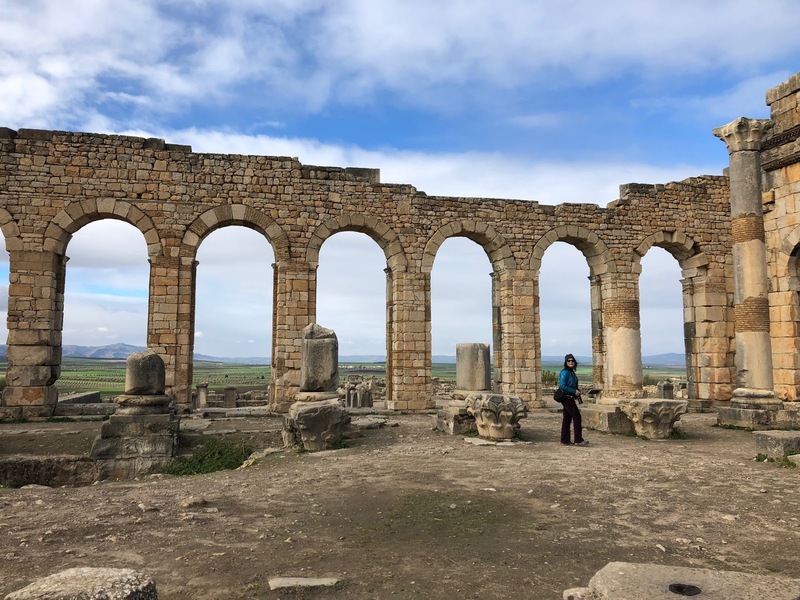 In the foothills of the Zerhoin mountains is the Roman city of Volubilis. It prospered for about 500 years until the withdrawal of the Roman Empire from the Kingdom of Mauretania in the 3rd century. 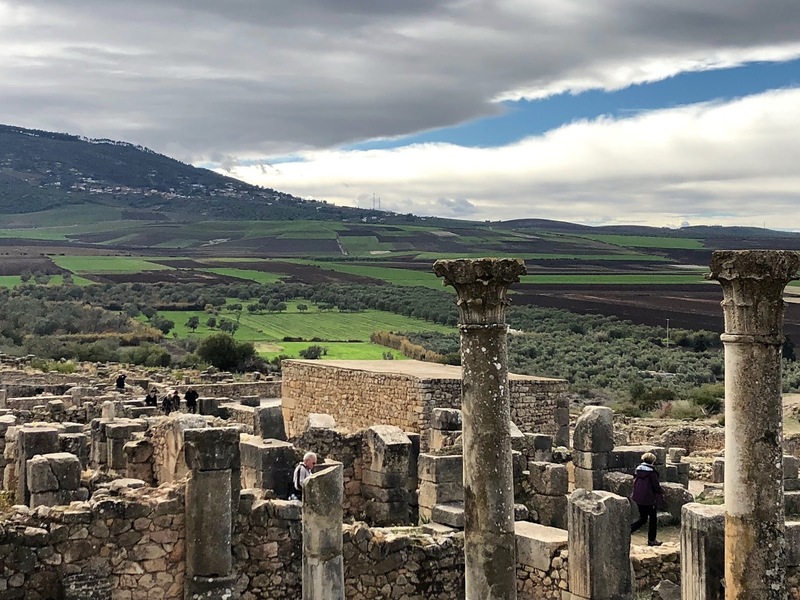 Despite the intact mosaics of animals and Gods and the water ways connecting pools it is still hard to imagine how people lived on this high plateau. What I was able to imagine was myself with a glass of red Moroccan wine enjoying the olive plantations and the brilliant farms below. In the afternoon we drove north towards the Mediterranean coast on muddy, unpaved roads through villages with chickens and small children poised by the roadside gazing at us with all their eyes. 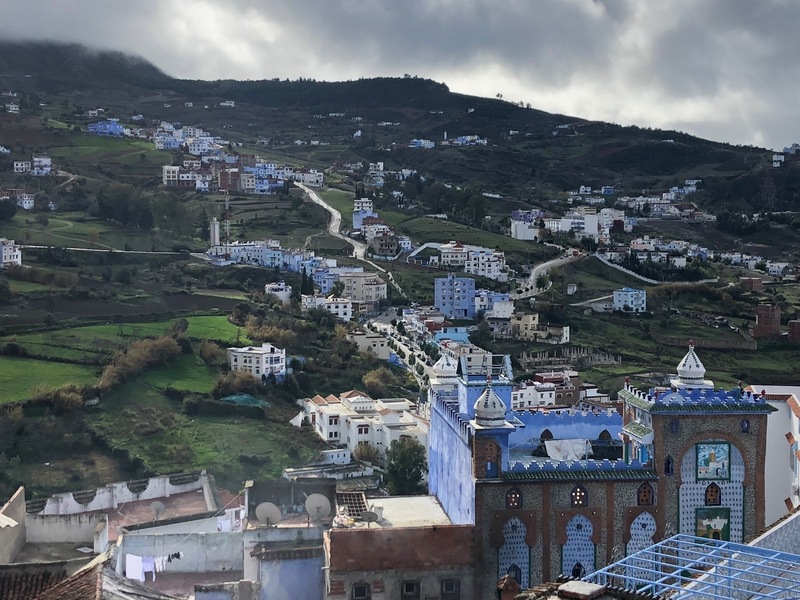 The road eventually got better while forests replaced the arid landscape just before arriving at Chefchaouen. Chefchaouen is a hill town with steep narrow streets with houses painted deep blue and white. It was founded in 1471 by Idrissid shorfa, descendants of the Prophet Mohammed. 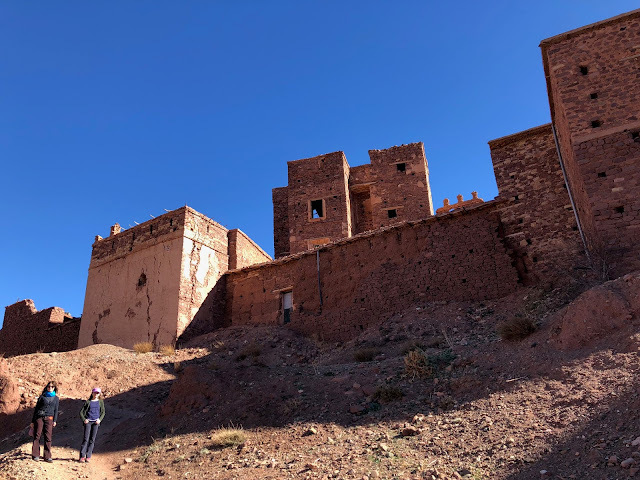 From our hotel Dal Elrio, run by a calm speaking couple we walked up to the beautiful northeast side of town by the Wadi Laou and the mills powered by it. The many children of the town with their little umbrellas filled the streets when a nearby school ended. Most stayed around until the late hours of the night and played street games. 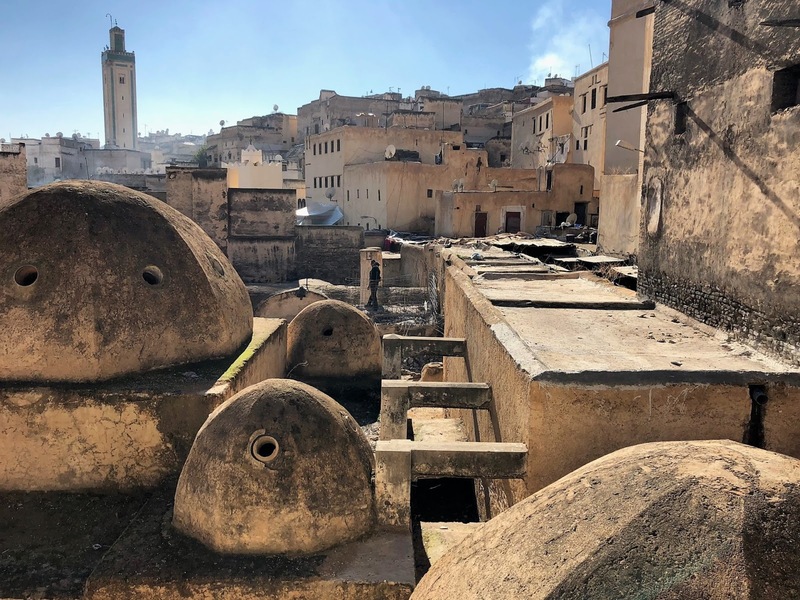 In the south side of town, Quartier Al-Andalus was lively with stores selling soap, dye powders, dates, olives, leather slippers and jellabas. 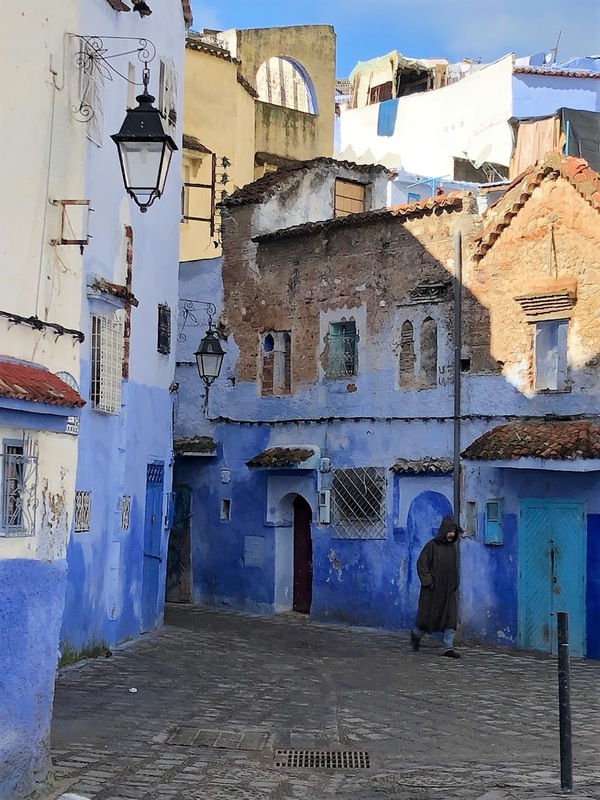 The heart of old town is Place Uta el-Hammam, where old men sit in the cafés with much to say to each other. After a meal of tagine with matlouh, flat bread, I fell a sleep in our backpackers hotel with the barking of dogs and occasional roosters. 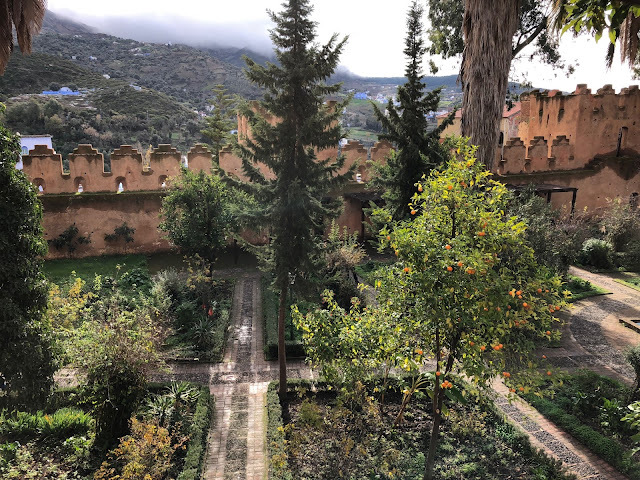 In the morning’s light, the gardens of Kasbah surrounded by brick colored fortress walls were delightful. Fondouk that used to serve to travelers and traders is now abandoned except an ironsmith’s shop. Further down, in the Quartier Andalus the streets are empty except a few elderly women walking slowly. I asked a bookshop owner to take us to a quarter we saw on a photo. He came with us all the way to the calm square with the Al-Hafta fountain in the center. The calmness was spoiled after a while when some of the stray dogs started fighting. A man threw somebody else’s shoe at them, one woman hit a dog with a broom and the fight was over leaving smiling old men and relaxed marmalade cats behind. The drive from Chefchaouen to Fès took about 3 hours. We left the rental car to the airport and took a taxi the medina. We arrived later in the evening to our hotel Riad Letchina, which was run by a French woman and her Moroccan helper Ahmed. Two boys who approached us as soon as we stepped out helped us find Bab Boujeloud in return for 25 dirhams. This is how it works in this city. There are always some idle boys who help you find places otherwise hard to find. Bab Boujeloud is where one of the thoroughfares of the medina starts from. It is busy with restaurants and slipper sellers. Under an old tree where cats climbed up and down, we watched people walking by while having harira, a traditional Ramadan soup, merguez, thin spicy sausages and fried sardines with mint tea. 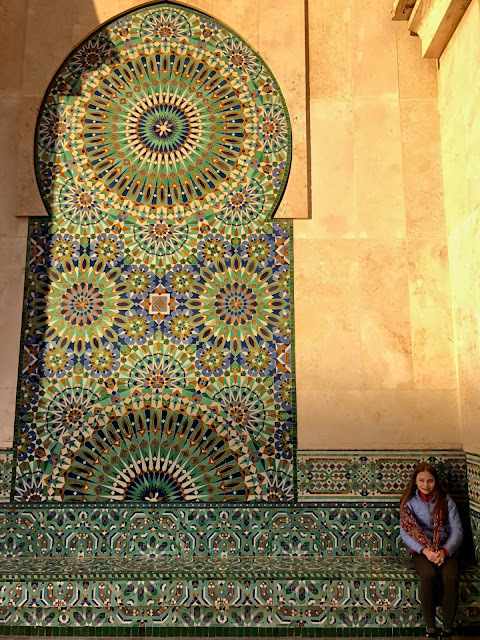 The oldest imperial city in Morocco, Fès is a bit closer to our time than Meknès. Wadi Fès divides the Andalusian Quarter and the Karaouiyine Quarter, where we spent our time. In the morning we visited the tanner’s quarter, the Chouara, which has been used to turn animal hides into leather since the Middle Ages. Pigeon poop, bark of pomegranate and mimosa are used as tanning solutions. 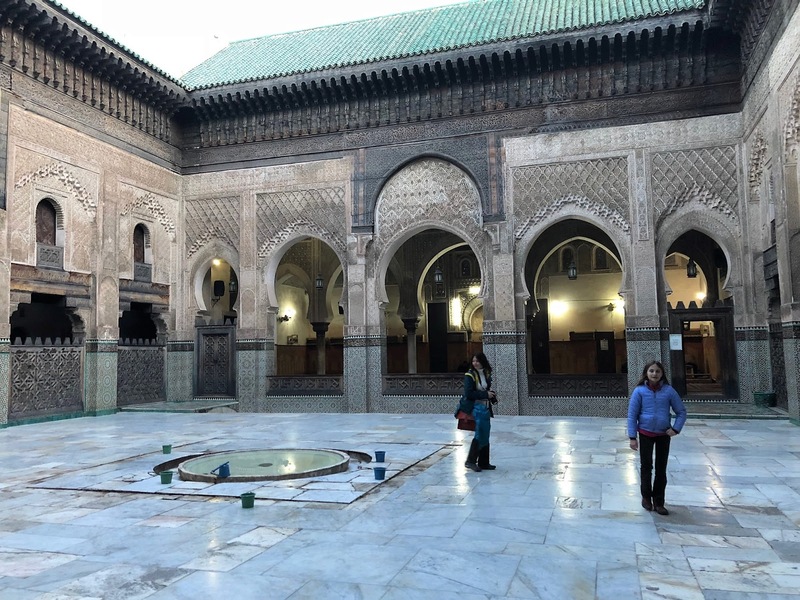 At the Karaouiyine Mosque I was allowed in only after putting on my jacket which provided some extra coverage. 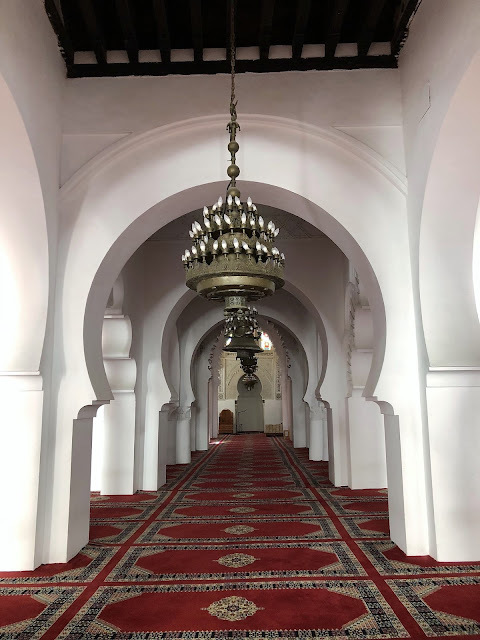 I still had to sit in the small area designated for women while my daughter and my husband wandered around the mosque. During this time, all I have been reading on Muslim women during the last few months started to sink in. For my recent print series titled “Overwritten Scripts” I had been studying the Quranic scripts and the literature on the restrictions on women in Islamic countries. My intent was to emphasize the inequality that exists based on socio-cultural norms rather than Islamic principles, which regard men and women equal in humanity. I felt like one of these women when I was sitting there idle, with nothing to do. Next to the mosque is El-Attarine Medersa built by Abu Said 1325. 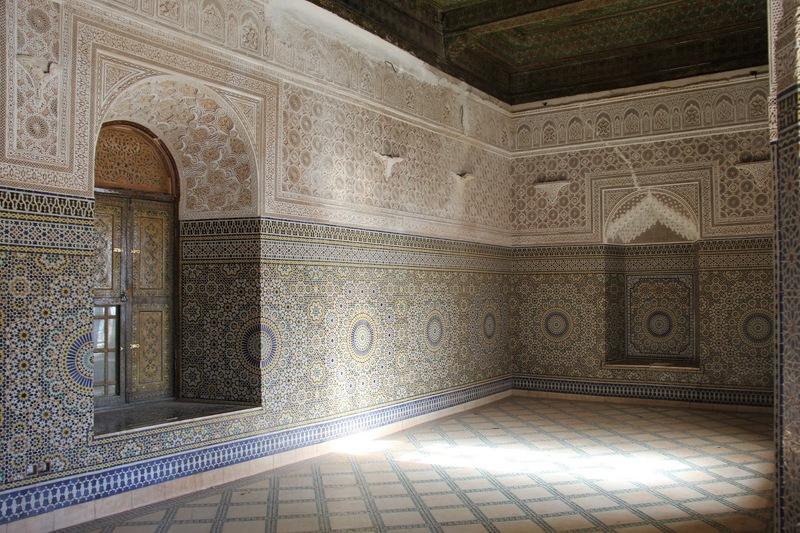 It was similar to the Bau Inania in Meknès with small rooms both in the upper and lower level. The courtyard was decorated with zelijj tiles in blue tones and wood carvings. 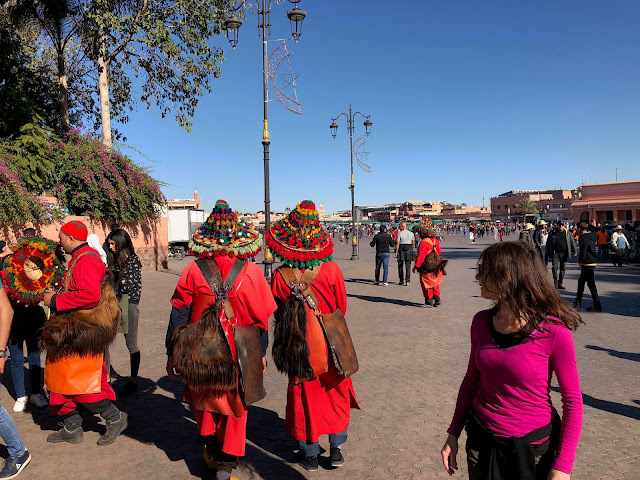 In a small square is the copper souk (market) which is lively with coppersmiths creating their copperware and men in red performimg dances. There is also a tiny library where a number of Arabic books are displayed. 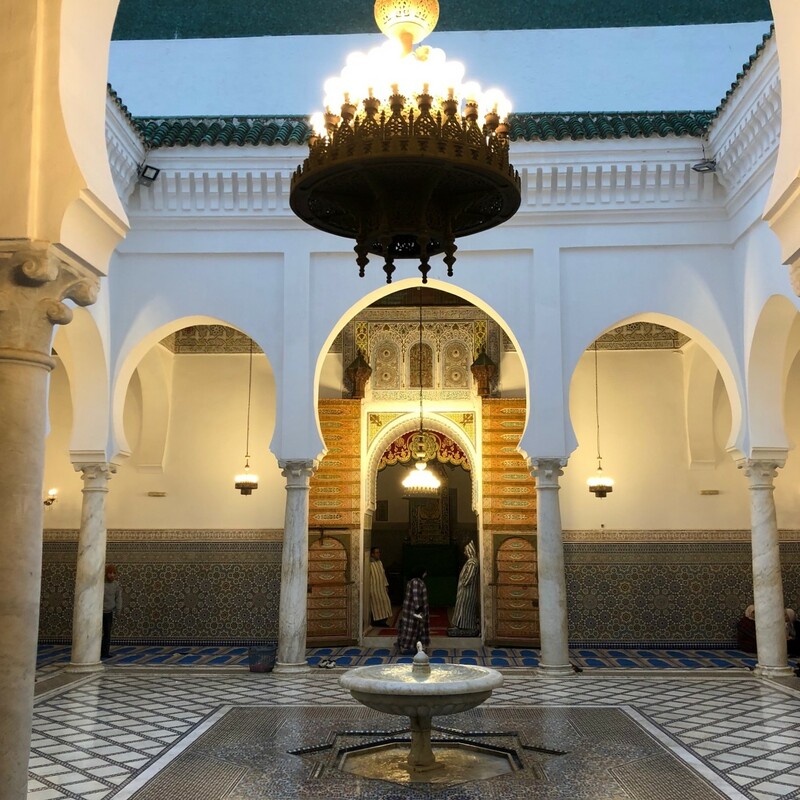 At the courtyard of Zaouia of Moulay Idriss, a man was giving water in copper cups as baraka (bereket in Turkish meaning blessing) which I hesitated to drink. The 8th century caravanserai Fondouk el-Nejjarine used to provide food and shelter to luxury good traders. It is now a well-kept museum displaying tree types, cobbler, bakery and carpenter tools, spinners, bride carriers and wooden doors. Bau Inania Medersa was almost closed when we arrived at 5:00 so it was nice to see it without the crowd. It is the largest medresa built by Merinids. The students must have been learning the Quran and studying music, algebra and in their windowless small rooms and coming out to the Moorish courtyard paved with marble and onyx to socialize. After an 8 hour train ride on comfortable but full first class coaches we arrived to Marrakech. Our hotel Riad Sahara Nour at the edge of the medina was again owned by a French couple, an extremely nice gentleman and his elegant wife who has published a few books, one of them being on the history of Marrakech. They opened the hotel in 2013 after looking at 150 Riads in the area. 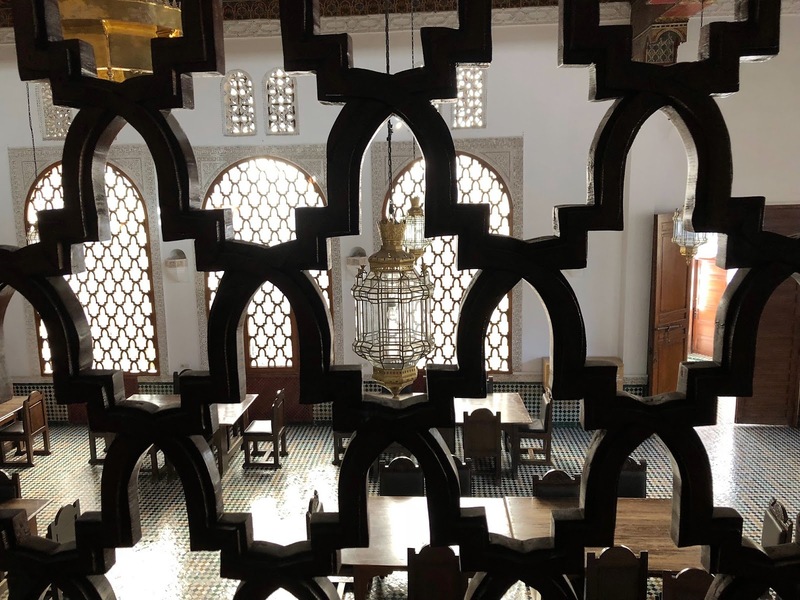 It is a beautiful space with sunny rooms with Moroccan kilims and furniture and a delightful courtyard surrounded by a dining room, study room, drawing room and a music room. François, the owner was very helpful in making suggestions for daily tours to locations he himself enjoyed. We found out quickly that Marrakech is much more chaotic than Fès. On the narrow streets of the medina motorcycles and bicycles pass both ways continuously leaving not much room for people to walk. In the afternoon, we spent a few hours watching people in the Place el-Fna, where any imagination is subdued. In this vast plaza, where criminals used to be beheaded until the 19th century, tooth pullers, monkey and pigeon men, acrobats, henna designers, medicinal herb sellers are spending their lives with the nonstop beguiling music of the snake charmers. During the last hour of the day, we went to the Palace Bahia. 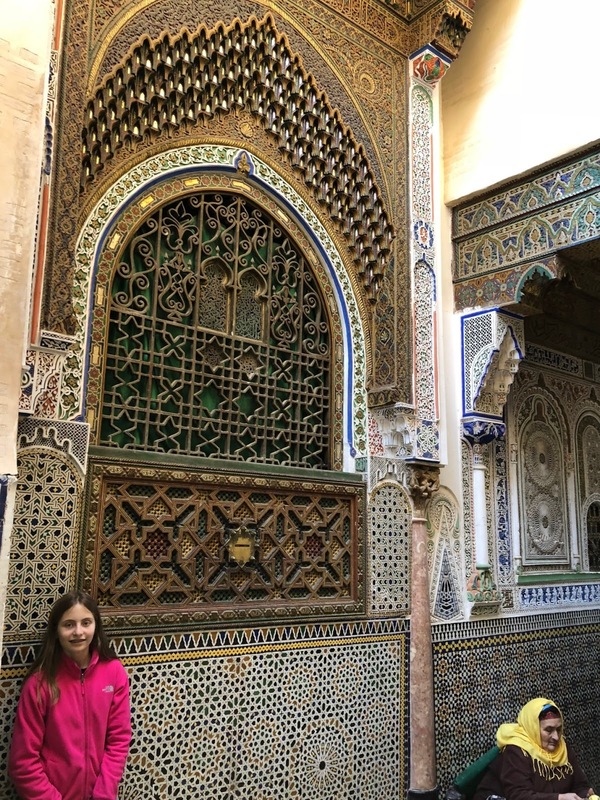 Built by two viziers it has serene walkways lined with orange trees and open courtyards in between elaborately decorated tile covered rooms. At night at the Place el-Fna, make-shift food stands were serving fish, calamari, vegetables and sheep heads. Small groups of Berber men were making music I could feel in my heart. It sounded like it was coming from far away mountains. Next day, in the new city we visited the Majorelle garden which was built by Jacques Majorelle in 1923. Later it was purchased by Yves Saint Laurent and Pierre Bergé. 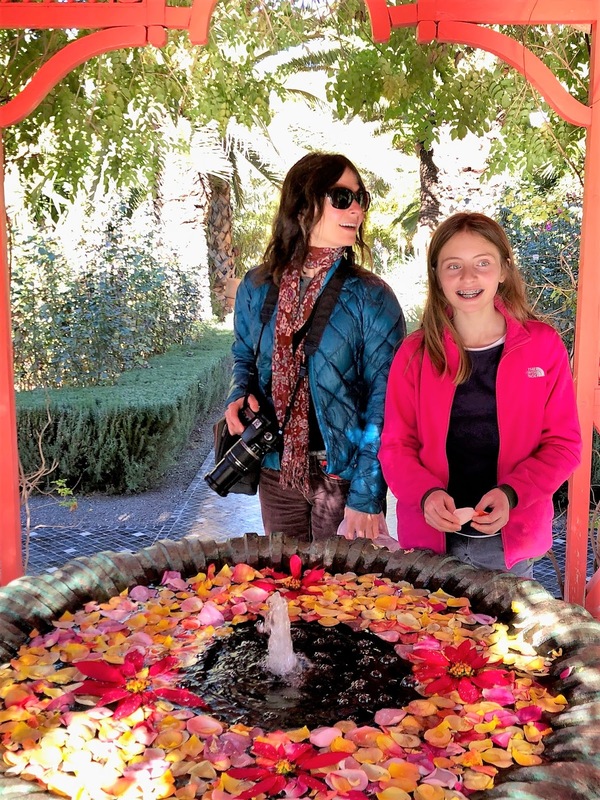 We walked among the blue tiled pools under the shades of tall bamboos. Yves Saint Laurent's yearly party invitation collages were displayed in a small gallery. It was elegant but unfortunately was preferred by too many tourists. 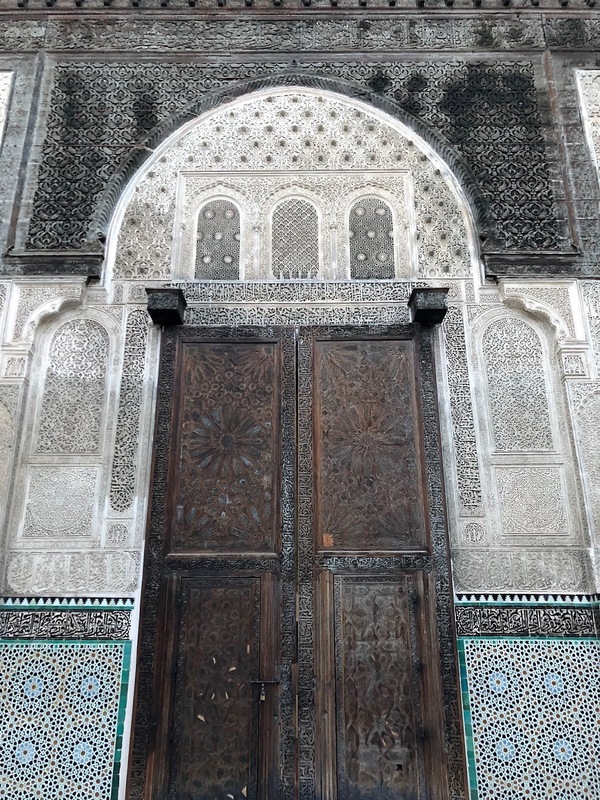 Back at the medina we walked by the Bab Agnaou, “hornless black ram” with Kufic scripts and arabesque figures. 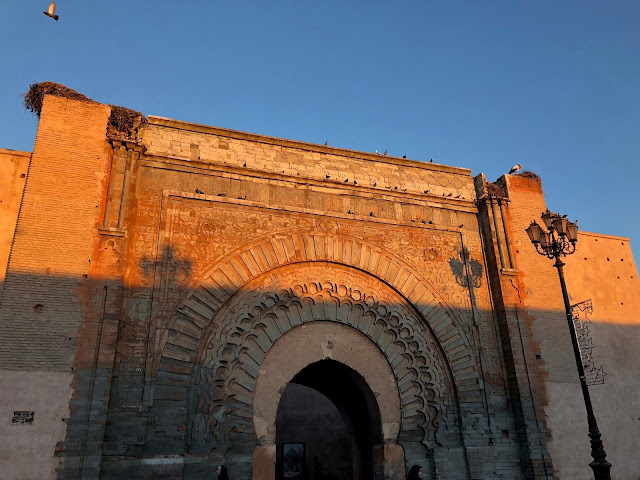 It was once the entrance to a 12th century Almohad palace. 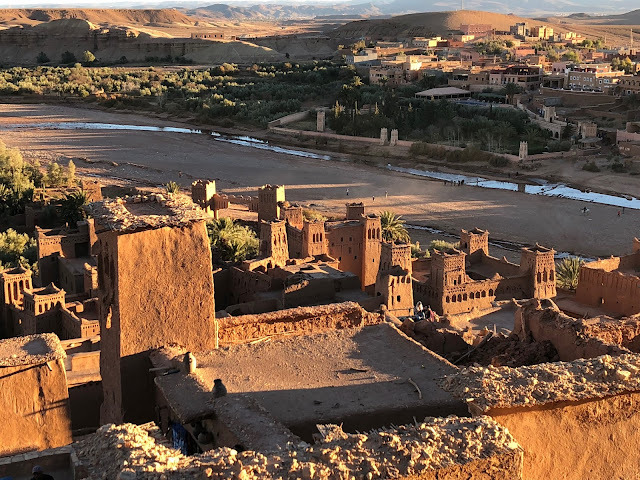 It is protected by the smaller Bab Er-Robb, where people of the Atlas Mountains used to sell a thick juice of grape, quince and blackberry. An artisan basaar close by sells beautiful crafts like teapots with lazuli and coral. 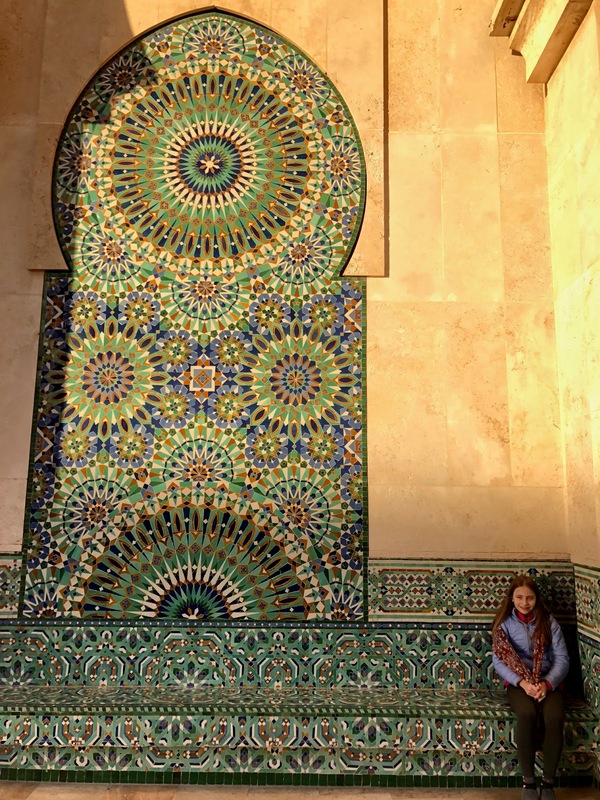 We sat at a café across from Kasbah Mosque’s minaret in green floral designs cheerful in the last rays of the day. On this lively brick colored quarter formed by a road curving around the large mosque complex, we watched old men in jellabas sitting in groups on benches and women in colorful velvet robes chatting at their doors. Horse carriages embellished with colorful fabrics seemed to be taking their passengers to a time in the past. 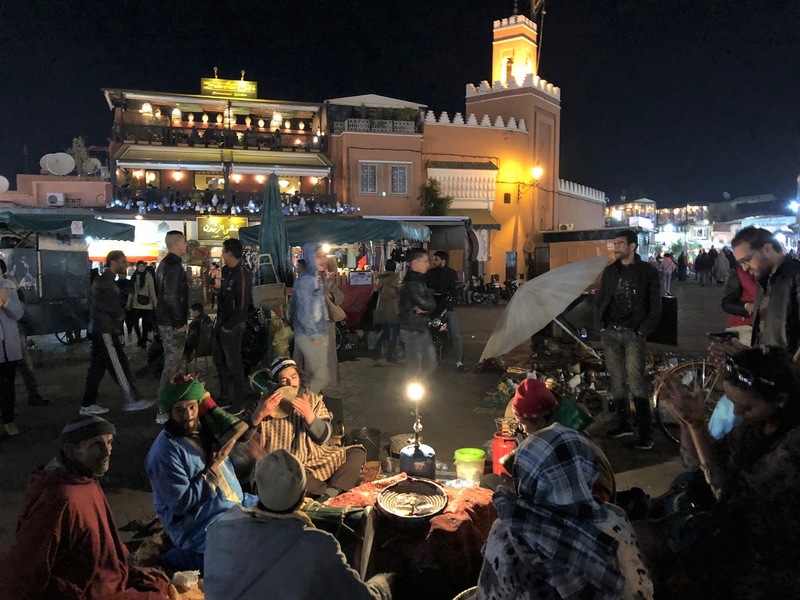 At night, we listened to Berber music at the Mouassine Museum suggested by François. Three men in white jellabas played traditional instruments; loutar, bendir and rebab and sang with voices deeper than the valleys of the Atlas Mountains they come from. 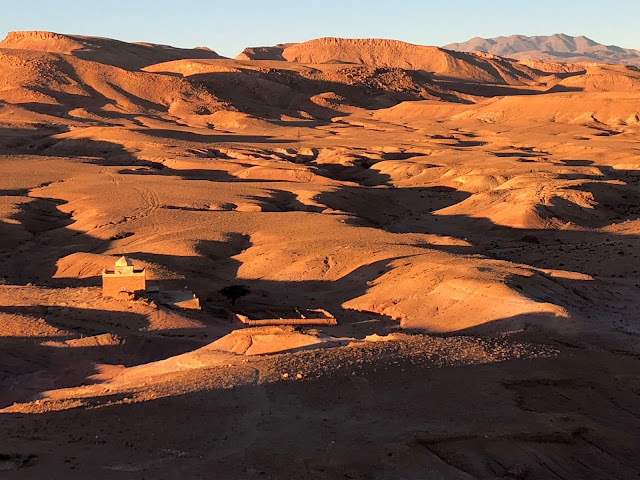 When the Sahara became a desert 3,000 years ago these Berber people migrated to the mountains. Others from the east joined them. 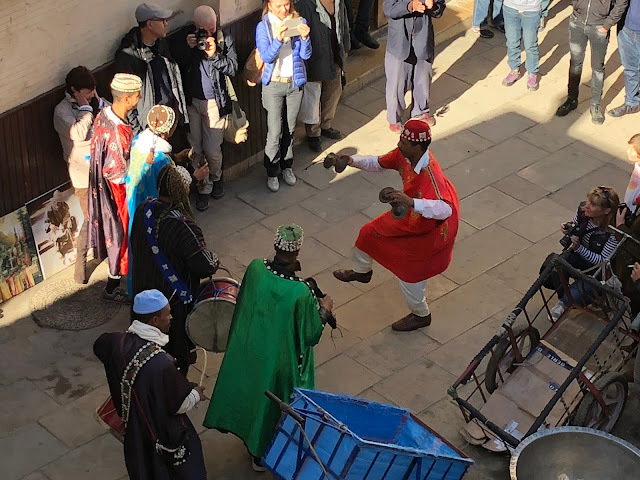 After the performance, we were invited to have mint tea and elegant Moroccan pastries on the terrace overlooking the roofs of the city. During a brief conversation, the French guide told me that the holes at the ceiling of the room where we listened to music were left open for the birds that were considered sacred. 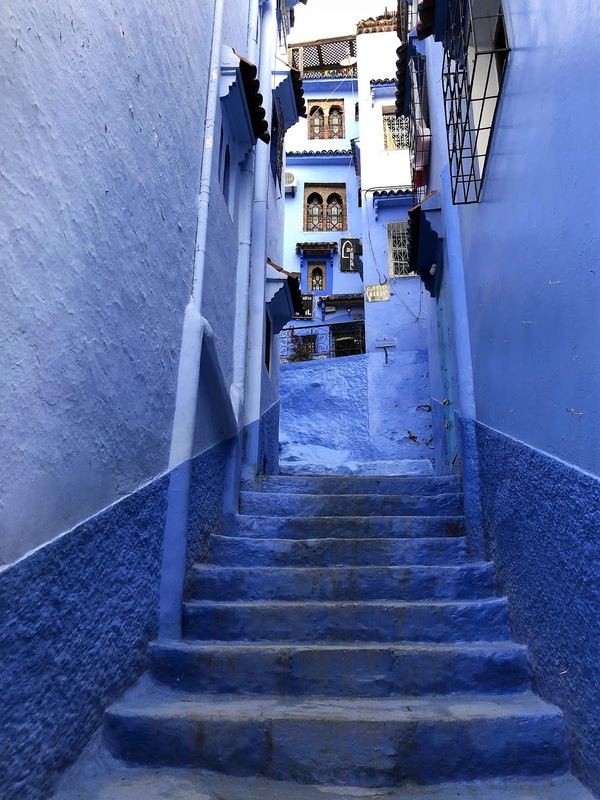 In each house in Morocco, birds are allowed to come in and every morning he wakes up to a bird singing in his room. The third day we took a tour with another family from the hotel. With the Atlas Mountains visible along the road we passed through dusty towns. Anima “le retour du Paradis by Andre Heller” was the first stop. It was designed by the artist Heller as a paradise on earth with wooden paths decorated with bronze and stone sculptures. Jardin Bio-Aramatique D’Ouraka was serene with aromas of grown herbs. We had mint tea watching the bright green of the gardens. We then visited a Berber village called Tafza in the Ourika valley. A small group of families grow herbs and raise chickens. The roads and houses all had the same red color. With smiling children waving to us, we climbed up to a house where we had a delicious tagine flavored with lemons. In the Ecological Museum we learned about carpets. They believe carpets have souls and they might die. One carpet which was a marriage gift from a mother to her son had a symbolic message on it, advising to name his son Muhammad. From Marrakech we explored the High Atlas Mountains, the highest peak in North Africa at 4,167m. We drove through a winding road built by French in 1920’s up to the Tizi-n-Tichka pass. In the lower valleys, the road travels through towns of red earth shaded by old trees surrounded by olive farms. In these towns donkeys either carry bundles of tree branches or people who sit sideways and kick. In between, an arid landscape and dry rivers with patches of occasional green lay beneath the snow-capped mountains. Through thuya trees the road allows views of deep valleys with farms then drops down to a brown colored dryness. Malachite and manganese stones are sold by the roadside and at the pass along with fossils and stone carved animal figures. I bargained with an angry man with a striped jellaba. Here is how it went: “original Berber scarf, one for 300 dirham”, “I pay you 50 for two”. “Ok 2 for 150”, “ I give you 60 for 2, ok”, “130”, “ 2 for 70”. “Ok”, said he and smiled. A small dirt road passes through the town of Telouit and reconnects with the main road. The town has an old dilapidated kasbah which was built by Al-Thami el-Glaoui at the end of the 19th century. He was killed after he switched to French and his family was exiled. Among the ruins where sheep and donkeys wander around, two elaborate rooms are the only remnants of his opulence. Elaborate archways with stuccos connect the rooms decorated with zelijj tiles and colorful cedar ceilings. Wrought iron windows open to the valley below. Further down the road are three towns, Anemiter, Maarufand, Taguendouchte with houses and ruins the same crimson color of the hill they cling on. Where the hills meet the river below are tiny bright green farms divided with water channels called seguias. 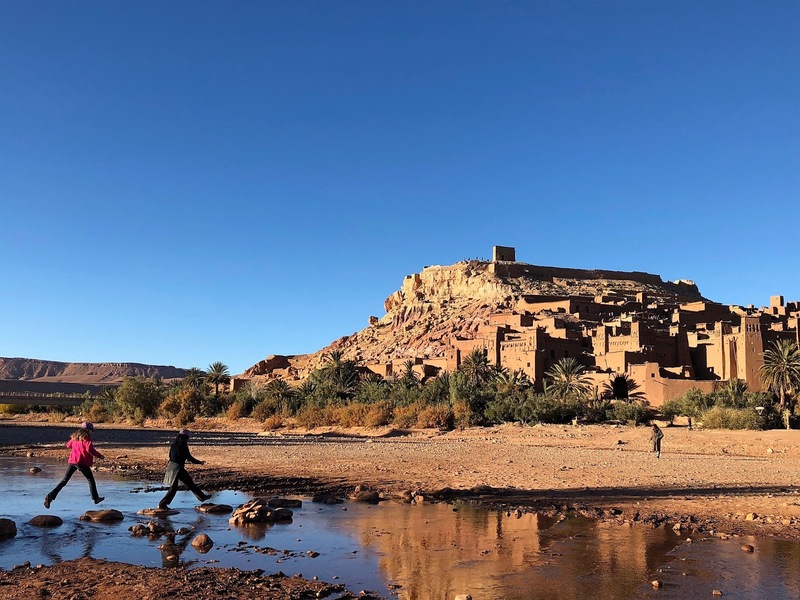 When we arrived to Âït Ben-Haddaou the reflection of the kasbah in Wadi Mellah was in its deepest red tones. Through the town’s narrow roads where the polite carpet sellers wait, we climbed up to the top. Down below men riding their horses were leaving dust clouds behind. Soon the desert hills started to look like silhouettes of caravans with the setting sun. We purchased two small kilims from a man speaking in softest tones of French and English. 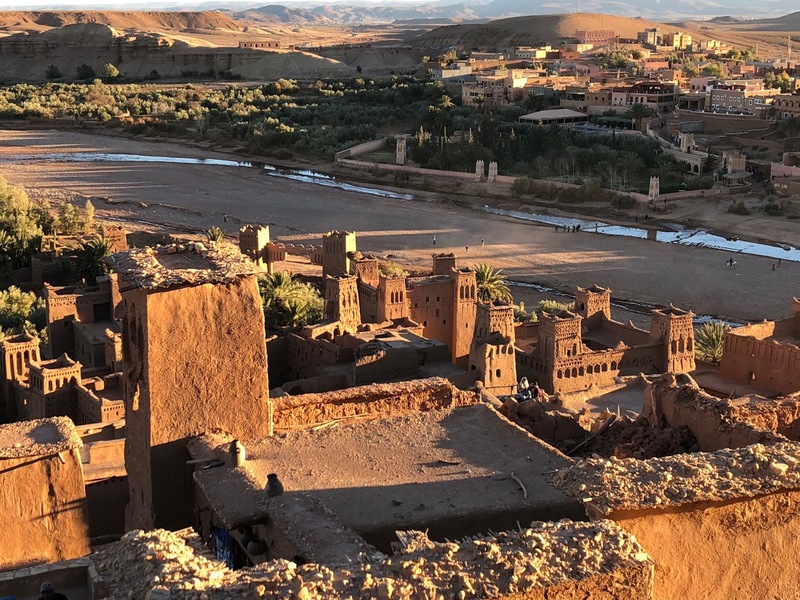 After having dinner at Chez Dimitri with signed photos of famous actors and actresses in the town of Ouarzazate, we went back to our hotel Riad Tamdaght. Next morning we left for the Draa valley, which is one of the main routes to the Sahara desert. On the desert plateau of Jbel Tifernine we picked a Berber man in a white traditional dress and blue turban, whose car was broken. On the way to Agdz, where his mother, three sisters and three brothers live, he told us about his life and also the lives of the nomadic people of the mountains. His father has camels in Mali, some of which are rented for film makers and some are eaten. He speaks French, English, Berber language, and Arabic. 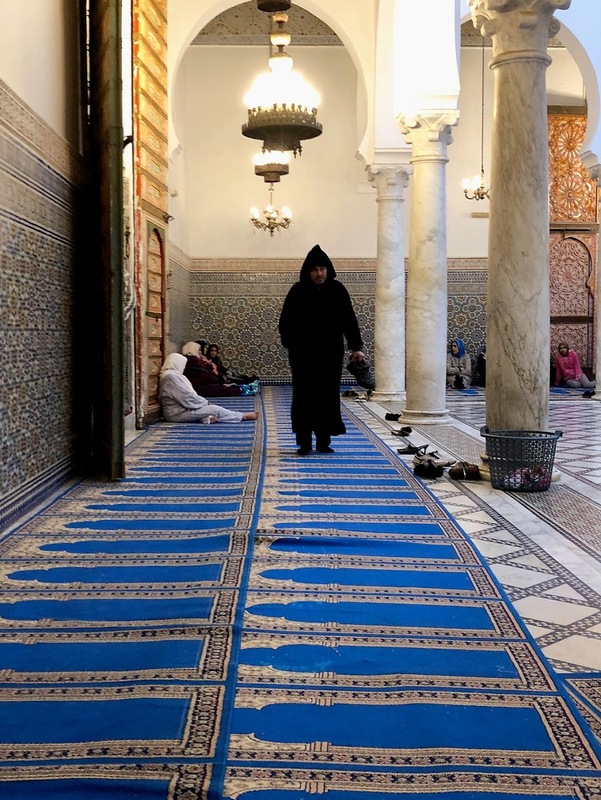 He is not so fond of the North Morrocco where they drink alcohol and do not follow the five pillars of Islam. He was a little heartbroken when we had to reject his money and his invitation for tea. One of the many kasbahs on the road, Tamnougalt, built from straw and earth once controlled access to the trade routes. Now pigeons inhabit the walls reaching out to the skies. We kindly rejected the guide who wanted to walk with us on the ruins. There was also a small kasbah museum with rooms used to serve as a granary, hamam and a kitchen. Further south in the town of Tamegroute is a ksar with a library where there are 400 books on algebra, astronomy and on Quranin definitions. An elderly man enthusiastically explained us the books on display. In the potteries, ceramics in beautiful green colors of mint and alfalafa or henna are made using earth brought from Mali. The kilns are continuously fed like hungry dragons. 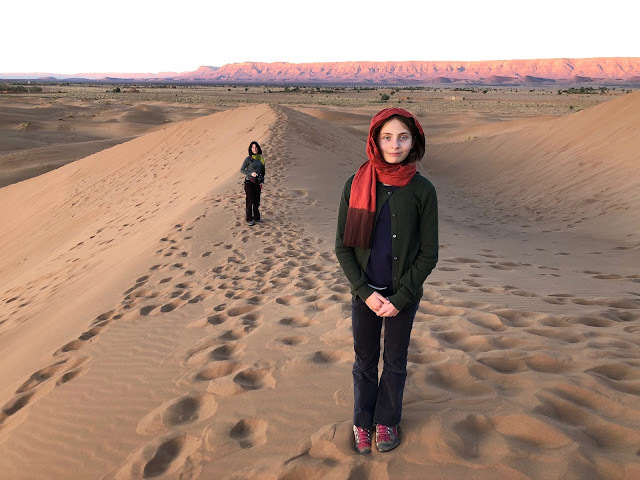 A few kilometers south from here is the Tinfou Dunes where an isolated ridge of red sand rise out of the packed earth. Men in blue turbans wait with their camels. My daughter and I took a ride around this dune with my husband walking next to us. We had the taste of how it would be to travel for many days as part of a caravan, slowly but surely. On our last day we visited a few kasbahs before going back to Marrakech. Tamdaght was in quiet ruins near orchards of apricots, pomegranate and fig. 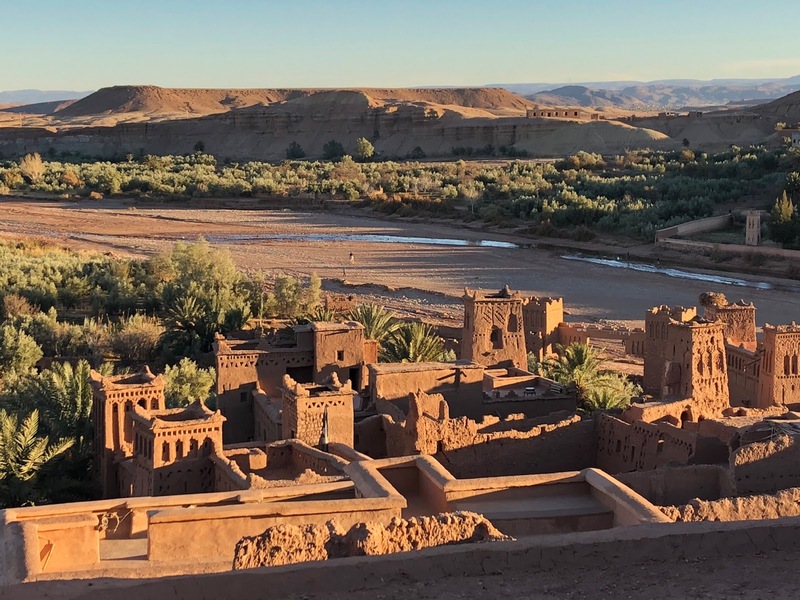 In Ouarzazate, which was built by French as a base to control the south in 1928 was the Taourirt kasbah. The sun coming through the wrought iron windows delighted each room with painted wood reliefs. Thank you for your comments and catching my mistake. I loved your country!